3D-Oxides provides a wide range of coated substrates with both single and multi-element oxide thin films on up to 6″ inch (150 mm) wafers. We can provide either uniform coatings or with controlled gradients in either thickness (single element) or composition (multi elements). 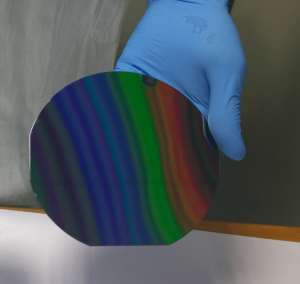 TiO₂/SiO₂ multilayer coating with thickness gradient on 6" inch wafer. 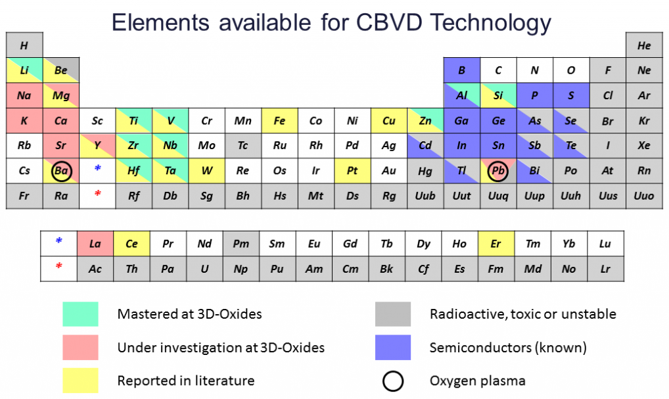 3D-Oxides can also provide customized thin films based on the combination of several elements to choose among the available ones (in green) as reported in the previous Periodic Element Table. Within R&D projects we can investigate further materials, specifically those containing the elements in yellow and red in our table. We can also provide multi-layers of different materials and/or 3D patterned thin films.